Glass Reinforced Plastic - Abbey Artstone Limited, Manufacturer of Architectural Masonry, Semi Dry, Wetcast, GRC, GRP, Cills, heads, balustrade. 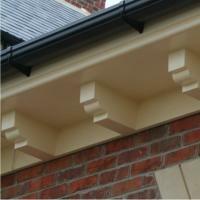 GRP is usually used to replace the timber aspect of external house building work. 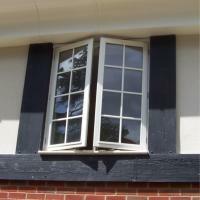 It can replace products such as dormer windows, copings, window canopies, dovecotes and detailed cornice. Its maintenance free, mechanically fixed and lightweight and can be produced in a massive range of colours to suit your needs.Products such as Dormers can be insulated with foam or encapsulated timber studding which enables the builder to self insulate and fix internal linings. Abbey Artstone Limited has collected over the years a large range of GRP door and bay window canopies ranging from simple flat units to elaborate curved bay window units designed with false lead rolls and with internal timber units to affix tiles to to create that tiles bay window roof without the hassle. Our canopies are realistic and maintenance free with a simple fixing detail to make installation a breeze. Most products are made bespoke to requirement but we have many moulds in stock and ready to use. 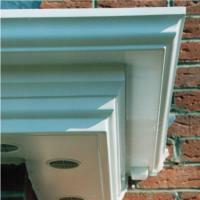 Our cornice is lightweight and maintainance free and adds a distinctive style and presense to any property. We have various defined styles and sizes available for your use or our in house design team is able to create a style to suit the needs of your building. All our corners both internal and external are manufactured as so creating no need for mitred joints. Dovecotes create individuality in a building. Abbey Stone Products range of self coloured lightweight GRP coping are simple to fit only requiring a single trade to position and fit the unit on site. We manufacture our units with integral dummy louvres to give the correct appearance we can also insulate the units if this is required. 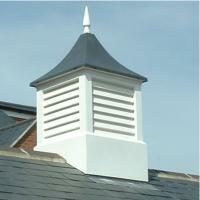 Many finishes and styles can be achieved other than our standard white unit with lead coloured roof. Abbey Artstone Limited GRP tudor boarding panels are lightweight, easy to fix and low maintainance make these units an attractive low cost way of improving the look of any building. The boarding can be supplied in standard lengths at various thickness and in various colours. Alternatively we can also supply full panels for gable units which have both the tudor boarding effect timber panels and the render infil panels all in a singular lightweight panel ready to install unit.